You know at the moment it's hard to play Pokemon Go. No, not because it's a hard game, but the servers are really unstable like crazy because of the high demand. Insane demand. At least there is a website to see if you don't even need to start your Pokemon app and try to play. 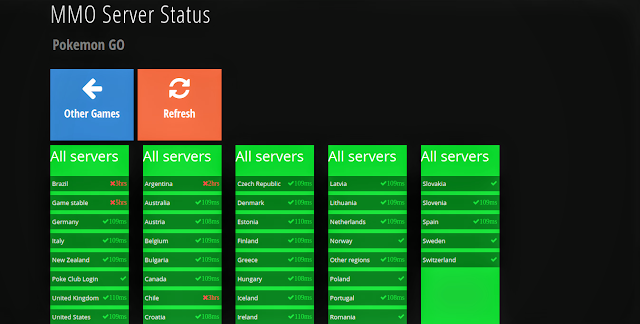 MMO Server Status has the Pokemon servers covered and checked if there are problems. It changes quickly, so keep an eye on the site. It's a good idea to check the status before you use a lucky egg or a lure module. If you do so and the server is unstable and going down, you lose precious time with that item. Last time I used a lucky egg without checking I only got 11 minutes instead of 30 minutes bonus that I could use. So be careful.